Volunteer - Muskegon Rescue Mission - Help Residents in Muskegon MI. 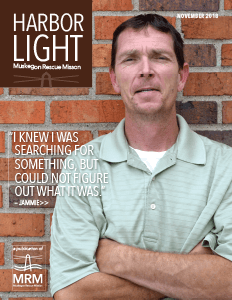 Muskegon Rescue Mission Reaching out and touching lives since 1907. Volunteering at the Muskegon Rescue Mission means more than just gifting time. It means clothing the needy, feeding the hungry, sheltering the homeless, demonstrating the love of Christ, and rescuing the broken. Not only are the homeless and needy touched by the compassion of our volunteers, but the volunteers’ lives are also touched. Serving others is one of life’s greatest privileges. Reaching out to the least, the last, and the lost in a personal way that says, “I care about you” brings encouragement to our residents and staff. Whether it’s serving a meal, tutoring a student, or helping at our thrift store or processing center – volunteers make a difference in the lives of people. No matter what your skill set, we have a volunteer opportunity for you or your group. Are you well organized? Good with children? Are you willing to serve meals? Would you lead a chapel or help in our food pantry? If you answered “yes” to any of these questions simply complete the appropriate application below. Applications can also be faxed to 231-722-7030. For more information on volunteering at Muskegon Rescue Mission please call our administrative office at 231.727.6090. Muskegon Rescue Mission is a 501 (c)(3). 86% of all gifts are put back into life-changing programs. Providing a beacon of hope through your support. Click to browse past issues.